Cinna cleared a field of fourteen dogs to win a 3-point major yesterday. Just seven points to go and she will be a field champion. 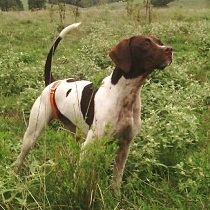 It was a great trial put on by the super nice folks at the Heart of America GSP Club (would recommend going to any event this club puts on) and got to run against some folks whose name you always hear like Jon Hann at Perfection Kennels, Chuck Parieti at Odyssy Kennels and Art Armbrust at Armbrust Kennels. Jon is the pro who has the Perfect Start and Perfect Finish videos. It was nice to finally put faces to the names. Barring some unforeseen circumstance I will be breeding Cinna to an NBHA champion as soon as the opportunity presents itself. Both parents have had good fortune in field trials, but this litter is being produced with the intention of being great family hunting dogs and no particular effort being made to produce field trial dogs. If you are interested in a pup feel free to drop me an eMail at stoneface.kennels@yahoo.com.